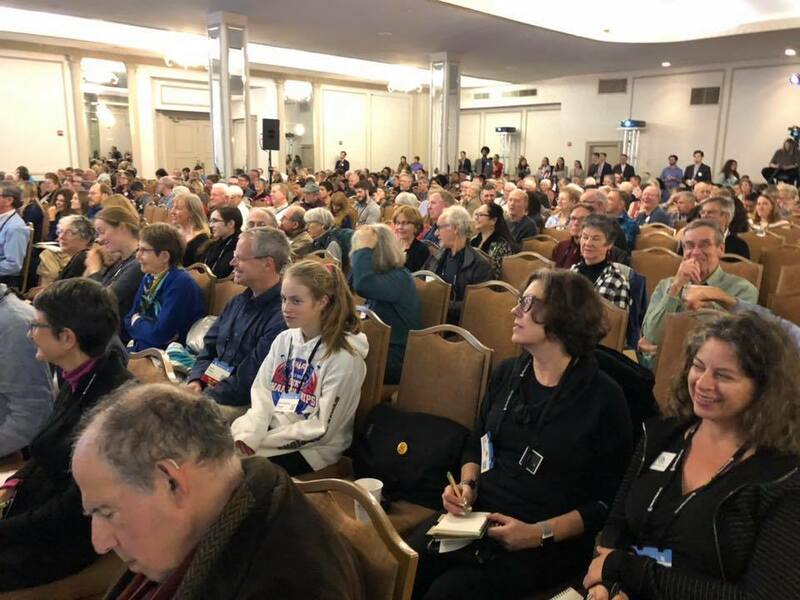 Citizens’ Climate Lobby Education Day in Washington D.C. Earlier this week I traveled to Washington D.C. to be trained and lobby our representatives as they came back from their recess. This was immediately following the midterm elections. There were 621 of us total, many of us (like myself) were there for the first time. Citizens’ Climate Lobby was impressively organized with full-day presentations and break out sessions to prepare us for our day on the Hill. We had a schedule with multiple meetings to speak with representatives from our State about making Climate Change a priority issue. As I have mentioned before, CCL is a bipartisan grassroots organization. Their proposal is a Carbon Fee & Dividend, which would provide a fast, efficient and fair way to transition away from fossil fuels. However, the main ask we were proposing in all our meetings was to make Climate Change a bridge issue, not a wedge issue. We feel that these policies will only happen when there is support in both main parties, not just the Democrats. In order to participate in this event, I needed to raise over $800 to fund the airfare, food, and lodging. CCL offered to give me a stipend as they encourage new people to go to this event. I needed to raise an additional $650 myself. I have never publicly asked for donations, but it was easier to do when I thought about WHY this was important. I was touched with the donations that came in from family and friends. It gave me a feeling of support to take on this new project of being more politically and civic-minded than I ever have by meeting and talking directly to our elected officials. During this entire trip, I felt the presence of each of my donors, and that I represented them and their families as well. 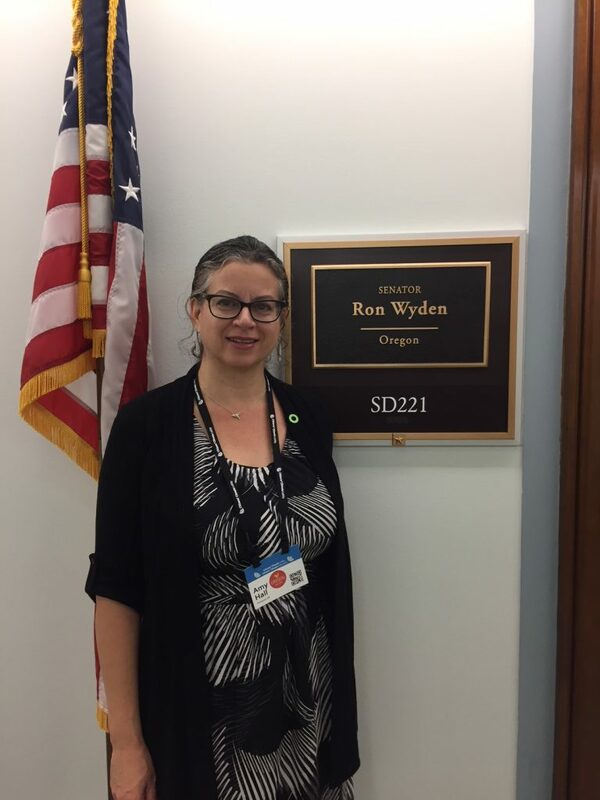 I participated in 4 separate Oregon meetings: Senator Ron Wyden, Representatives Earl Blumenauer (from my district), Peter DeFazio, and Suzanne Bonamici. 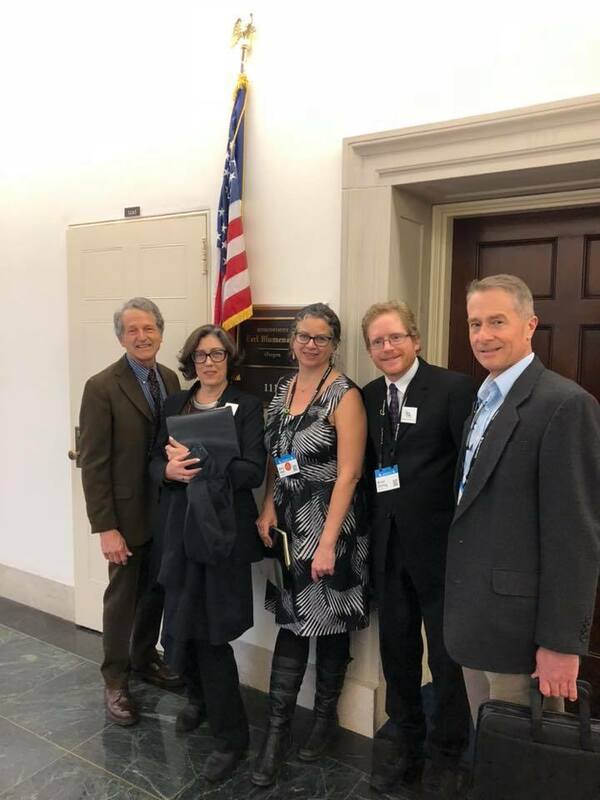 In each of these meetings, we ended up talking to their top aids, although I did see Senator Wyden as he walked through our meeting room several times. We started the meetings by introducing ourselves and stating the reason we were there (regarding our concern about climate change issues). In each of those meetings I let them know about my team of 15 families (16 groups total counting CCL) who I represented. The fact that we would travel across the nation to meet with them also indicates the importance of this issue. Our different teams all had roles and had help preparation meetings in advance. I took notes, was time tracker, and answered specific questions. There were very experienced people in each of my groups which helped a lot. I can see why CCL also wants new people to join so they can see it is not just the same people coming each time. We were very respectful and professional. I came away from all these meetings feeling like while there was agreement, there was not necessarily any optimism about passing bills with Republicans in control of the Senate. There were discussions of needing to wait for the new representatives to join in January (understandable), but also talk of waiting until after 2020 in order to take action because of Trump and McConnell. This was frustrating because we can’t wait two more years. Not with the IPCC report telling us we have 12 years to get to significantly lower carbon emissions (and it could actually be less). At the same time that we were meeting in the different offices, around 200 young people descended upon Nancy Pelosi’s offices to demand a New Green Deal. They received more attention, and I believe made a great impact. Although CCL has a different approach, I was glad to see these activists doing their direct action too. I’m encouraged by the new representatives joining forces, and they seem more forceful (or less jaded at this point). As awareness and inaction have increased and time has decreased, it is time for all of us, and the young people especially who will be the most affected by this, to demand change! People need to demand that their elected officials work on carbon emissions because we have fossil fuel and large corporations fighting against this due to profits. After seeing the research done, we can have more jobs and lower energy costs once we bypass these groups. Most importantly, we can have better health and a future for our children. After our meetings on Wednesday the 13th, we had a reception with all vegan food, speakers and music. They asked for first-timers to come up to a microphone at the front and share their experience. I decided that was even more out of my comfort zone that all the rest of it- raising money, lobbying, etc. As people who know me well can attest, I really don’t enjoy public speaking in general (except for doing climate change presentations). I didn’t even speak at my best friend’s wedding as a maid of honor (sorry Christy)! As I stood in the back listening to the others share their experiences, I was tapped on the shoulder by a fellow CCL Oregonian. “You should go up there, it inspires and motivates the others”. I wanted to just stay in the audience but realized that I was only here thanks to the generosity of CCL and my donors. I went up and spoke to the large crowd about why I was here, and who helped me get there. I’m not even sure what I said, but I know I mentioned that we all have to push ourselves to get out of our comfort zones, this is just too important. I had many people thank me later, and tell me they really liked what I said. It was a great feeling for me to overcome that fear, and grow. A personal unexpected bonus of this trip was deepening friendships with my fellow CCL group, and getting an amazing roommate from Bend who made it an even better experience. I want to personally thank again, these 15 families in addition to CCL who helped me talk to our representatives and make our voices heard. These individuals also represent their spouses and families. Phil & Helene Hall (my parents who simply support these efforts because they believe in me). Thank you, I will never stop pushing for change for you, and for all of us.